The sea between Mersing and Pulau Besar was as flat as one of the pancakes I used to make before Mrs M introduced her silly low carbohydrate routine into our lives. Shoals of fat fish darted around the legs of the jetty while small groups of needle fish hovered in close formation using their fins to apply the occasional positional correction. We dumped our bags in the hut in the Aseania Beach Resort before consuming the most enormous lunch. 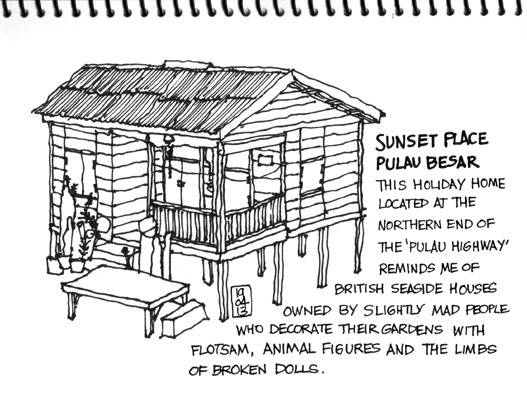 The beach beckoned Mrs M. I don’t do beaches, so I strolled northwards towards the end of the ‘Pulau Highway’ for a bit of doodling. It was a glorious day. 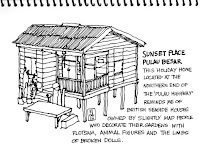 The last hut on the path, called ‘Sunset Place’ reminds me of a British seaside house owned by a slightly mad person who decorates the property with bits of rubbish. It even has a sign in the front asking for ‘Silence please, participants on beach’. By the time I had returned to base, Mrs M had turned the colour of a pork scratching despite sitting in the shade. As dusk arrived, we sat freshly-showered and smelling of orange insect repellent on the edge of the beach looking towards the mainland as the sun dropped below the horizon. People pay a lot of money for this sort of view. I don’t know why more people don’t come from Singapore - but I’m glad they don’t.